Here is a St. Patrick's Day themed card with a four leaf clover. Four leaf clover. One leaf for Hope. One leaf for Faith. Another for Love. The last for Luck. This is a simple and cute little 3-D clover that is paper pieced. This sentiment goes perfectly with it. With only a couple of layers and trim, this makes for a great card to help welcome Spring or to send St. Patrick's Day wishes. Supplies: Unity Stamp Co. Lucky Ones, doily, patterned paper, twine, brad, foam tape and Pretty Pink Posh sequins. This is a meaningful Spring card with flowers and a 3-D butterfly. Sentiment: Because of you... I laugh a little harder, cry a little less and smile a lot more. I love what it says. This could be a card for any time, thank you, family, friendship, love, thinking of you and more. The butterfly is pretty on its own, but I gave it movement and dimension by lifting the wings. I wanted it to be dancing around the flowers. Supplies: Unity Smile In Your Dreams and Butterfly Endearment, MFT dies, Copic markers, brads and ribbon. This is perfect card to celebrate motherhood. I think it is great for mother's day, new moms, birthday and more. Sentiment: Mother is another name for love. Having a child is to have your heart walk around outside of your body. This sure is TRUE. I love the sentiment as much as these gorgeous flowers. The heart is popped up and includes tulle. This was colored with watercolor pencils. 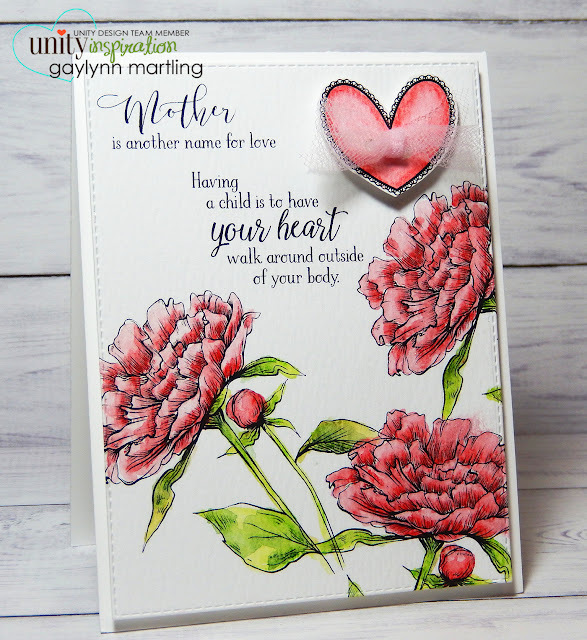 Supplies: Unity Stamp Co. Another Name For Love by Gina K. Designs, Derwent Inktense watercolor pencils, My Creative Time dies and tulle. Here is another bible journal page. This time, I layered panels and journal cards. I started by coloring in the tree scene with Copic markers. When I use Copics in journaling, I always do so on a separate cardstock layer, to avoid the bleed through of the colors. Journal cards and sentiment panel, trimmed and layered, were added as accents using double-sided tape. I can tell, this layering will bulk up the bible eventually. But, since these images are large, I kept the layering to the pages with open spaces. For this blog, I share the art part of my bible journaling. I tend to keep my personal journal writing private. I have a series of bible journal articles documenting my trial and error process, exploring different ways to decorate with the thin bible pages. This may be helpful for those wanting to try out creative bible journals, art journals or planners. If you would like to see a particular crafty technique here or a video tutorial, mention it in the comments. Supplies: Unity Stamp Co. Angie's Tree, Copic markers, cardstock, journal cards, double-sided tape, My Creative Bible. Today, I am up on the Unity blog with this project and the stamp of the week reminder. Sentiment: Twinkle twinkle little star, brave and beautiful is what you are. This is an encouragement card with more of a breast cancer theme in pink. The bird is duplicated and I added the tiny white dots as accents. 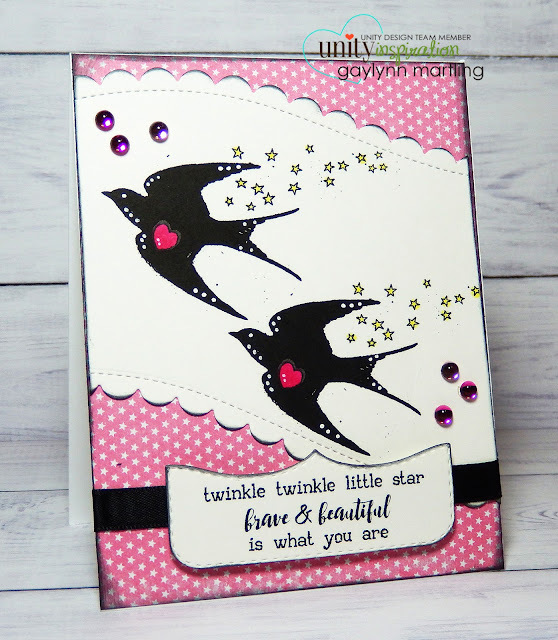 Supplies: Unity stamp of the week Twinkles & Wings, dies by Simon Says Stamp and My Creative Time, Copic markers, white Sharpie and gems. Today begins a new release weekend at Unity. This is one of the lovelies featured. I love fresh flowers, especially placed in a simple mason jar vase. These flower have a 3-D look. I popped up one of the clusters for the look and texture. I mixed the sentiments so that it can be used for birthday or most any occasion. I made a quick tip video tutorial with these flowers. Supplies: Unity Stamp Co. Hello New Life & Hang In There Lady, Copic markers, dies by My Creative Time and Winnie & Walter. If you would like to see a particular crafty tutorial showcased here, mention it in the comments. Stay tuned for more new release projects through the weekend. Today, I am sharing a shaker style birthday card. 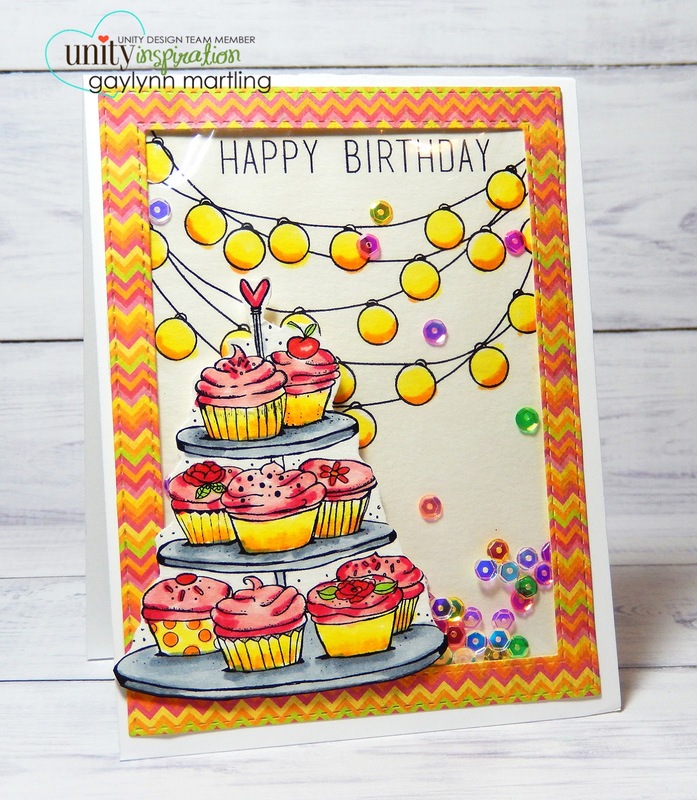 This is bright and happy with sequins, cupcake and lantern lights. It includes a sequin pouch, made using a fuse tool and a photo sleeve. I made a video tutorial for this shaker card. If you would like to see a video tutorial with a particular crafty technique here, tell me in the comments. Supplies: Unity Stamp Co. Kits Unexpected Places and When You Smile, sequins, Copic markers, Canson watercolor paper, My Favorite Things die-namics, photo sleeve and American Crafts We R Memory Keepers Fuse Tool. Today, I am up on the Unity blog with these watercolor flowers. Sentiment: No rain, no flowers. 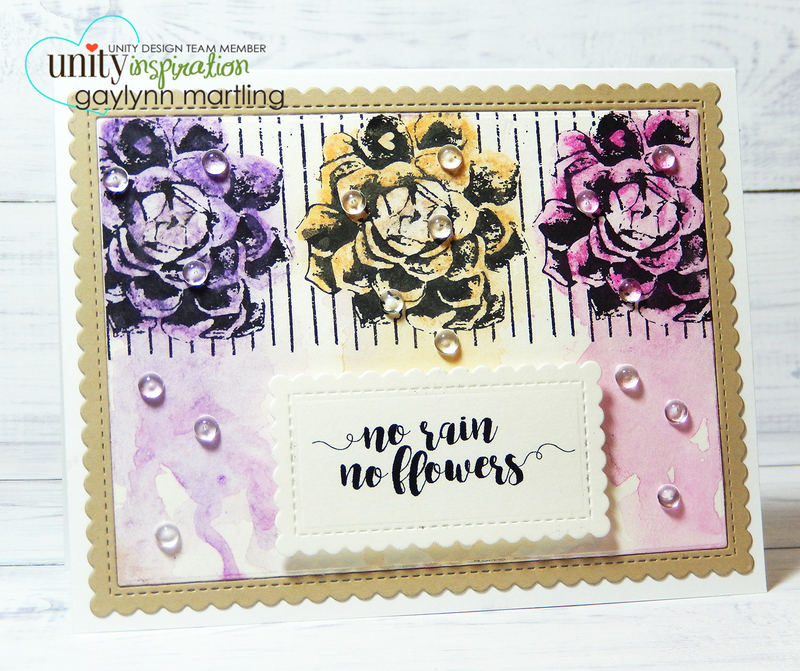 For a rain theme, I made a wet watercolor look with water droplets. Using three soft watercolors, it has a rainbow look. This card is great for encouragement, support or any time to lift spirits. Supplies: Unity Stamp of the Week No Rain No Flowers, Prima Water Soluble Oil Pastels, MFT dies, Ranger archival ink, Pretty Pink Posh droplets and Canson watercolor paper. Here is an adorable owl birthday card. Sentiment: Happy Birthday. I'm all dressed up & ready to party. This little fella is so cute. I like the little bow tie and hat. There are lots of layers and die-cuts along with a video tutorial if you want to get the look of layers. Supplies: Unity Stamp Co. Owl I Do Say by Lisa Arana, dies by Lil' Inker Designs and My Favorite Things, Copic markers, brad, BasicGrey paper and ribbon. Today, I am sharing a bible journal page decorated with paper art. I love making my journal pages pretty and inspirational. Sometimes I decorate my bible journal pages using paper art to avoid certain markers and inks bleeding through to the back side of the thin pages. Other times, I get creative directly onto the pages themselves. I am no expert in this area. But, I have a few posts documenting my trial and error process. I explore different art mediums and the outcome when used on thin bible pages directly. These techniques can also be used in planners and other journals. To see these posts, go to bible journaling. I made a video tutorial for this bible page. 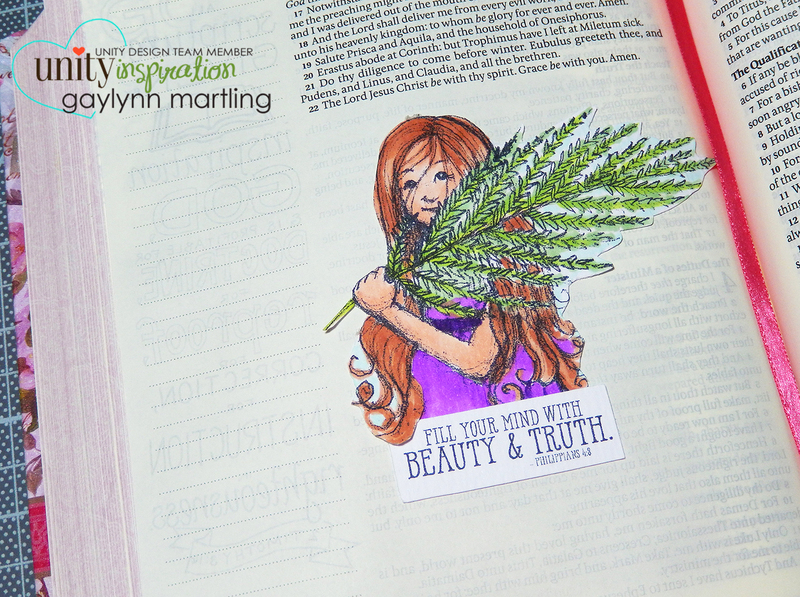 I hope this encourages you to add more beauty to your journaling. If you would like see a particular technique or project in a video tutorial, please mention it in the comments. 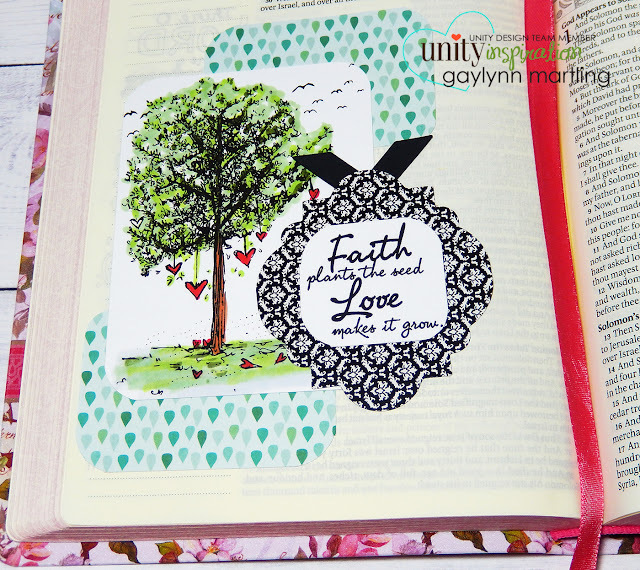 Supplies: Unity Stamp Co. Grace Upon Grace by Phyllis Harris, cardstock, Copic markers, My Creative Bible, double sided tape and Ranger archival ink. Talk about sweetness... this is the epitome of it. Just look at this darling storybook scene with a bear and little girl. This is another project included in the Unity blog hop going on now. Use this link to hop along with the Design Team. All of the stops are posted there. This is the adorable artwork by Phyllis Harris. I adore the innocence of it all. I made a quick tip video tutorial for this framed scene. I will have more new release projects posting soon. Supplies: Unity Stamp Co. Thank You Kindly, Copic markers, Pretty Pink Posh dies and sequins, Ranger archival ink. 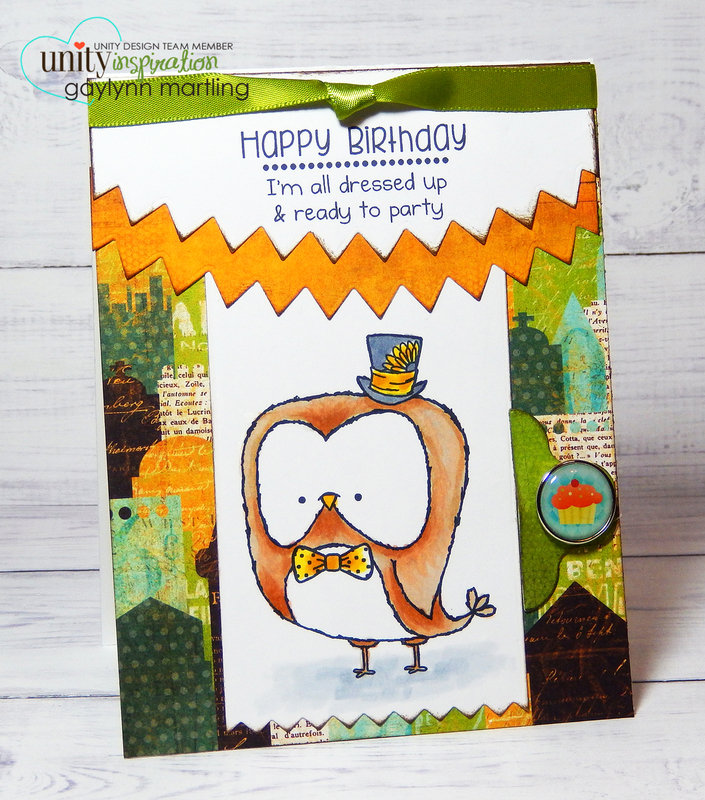 Today is the Unity Stamp Co. blog hop, new release and sale. 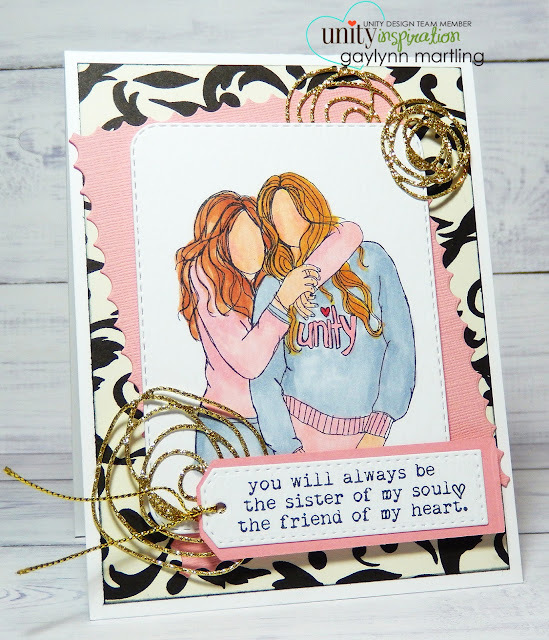 I am sharing this friendship card with an image by the talented Unity artist Angie Blom, as part of her Angie Girl line. Sentiment: You will always be the sister of my soul, the friend of my heart. This is a layered friendship card that can be used for birthday and many occasions. It is in the colors of pink, gray, black and gold. I have a quick tip video tutorial for this layered project. Supplies: Unity Stamp Co. Unity Girls by Angie Blom, dies by My Creative Time and My Favorite Things, Copic Markers and glitter paper. I will be sharing more new release projects this week, so stay tuned.